Precisely 12 months ago, Ireland Craft Beers attended the 2016 Irish News Workplace & Employment Awards at the Titanic Building in Belfast. Fast-forward to June 8th 2017 at the same event, we picked up the Entrepreneurial Spirit Award for the second year running. Liam Brogan and Shane McCarthy from Ireland Craft Beers Ltd receiving the Entrepreneurial Spirit Small Organisation Irish News Workplace and Employment Award, from Sponsor Roger Wilson of Armagh City, Banbridge and Craigavon Borough Council. 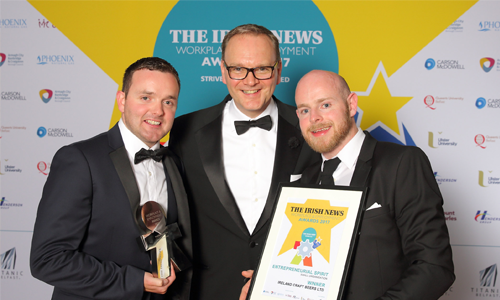 This was the 11th year in a row for the prestigious Irish News Workplace & Employment Awards night. With 600 in attendance and 21 winners to announce, we were entertained by the St Patrick’s Junior Choir who opened proceedings with two rousing renditions of the songs – ‘Roar’ – which wowed the public on Britain’s Got Talent. The presentation ceremony was overseen by BBC broadcaster Jim Fitzpatrick and assisted by our fellow County Down comic Paddy Kielty. Our award winning entry this year was titled ‘Brewing up a Business’ so here’s a small snippet: “Utilizing a tight knit, flat structured team gives us a dynamic and quick turnaround for critical decision making; while evolving our business model at every step has allowed us to stay ahead of competition. “We have continued to evolve our world-class logistics platform for Irish Micro-Breweries, Cideries and Distilleries, accommodating their growth into new international export markets through our strategic partnerships in focus markets. Once again, we are very grateful to The Irish News for awarding us with this prize this year and appreciate all our customer and suppliers who continue to support us. We intend to continue to push the great Irish Craft Beverages from our country on a worldwide scale. A few days later in New York, we were also lucky enough to be inducted into The US-Ireland Top 50 Business for 2017 sponsored by the Irish Echo.